North Korea appears to have fired a ballistic missile from a submarine off its eastern coast, South Korea says. It is not clear whether the test was authentic, and if it was, whether it will be considered a success by the North. A successful test would be significant because submarine-launched ballistic missiles (SLBMs) are hard to detect. It comes as North Korea gears up for a rare and significant party congress next month. North Korea is banned from nuclear tests and activities that use ballistic missile technology under UN sanctions dating back to 2006. "North Korea launched a projectile which was believed to be a submarine-launched ballistic missile around 6:30 pm (09:30 GMT) in the East Sea (Sea of Japan) near the north-eastern port of Sinpo," a South Korea defence ministry spokesman said. "We are keeping close tabs on the North Korean military and maintaining a full defence posture," he said. North Korea has yet to report the test in its own official media. The secretive state has claimed to have carried out similar tests before but some doubt those claims. The US says photographs supposedly showing one launch in December were manipulated and others think the North has fired missiles from submerged platforms, but not submarines. Regarding this latest test, South Korea's Joint Chiefs of Staff said in a statement that the missile travelled about 30km (19 miles), whereas a typical SLBM can travel at least 300km (186 miles). North Korea has so far conducted four nuclear tests - the first one in October 2006 and the latest in January this year. The UN Security Council responded to the latter by imposing its strongest sanctions to date over the North's nuclear weapons programme. 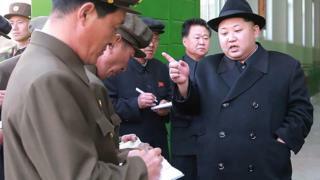 Last month North Korea said it had developed nuclear warheads small enough to fit on ballistic missiles, although experts cast doubt on the claims. Analysts believe the North may be gearing up for a fifth test as a show of strength ahead of the North Korean Workers' Party Congress, the first since 1980.